The power of the Decan has been little explored in modern Magick, so let us start by indicating what a Decan or Decante is. Astrology has many ways of identifying various parts of the Zodiac. The use of decans in Magick and Astrology was first recorded by the Egyptians who set the boundaries of a decan as 10 day time periods, so for each 30 day sign of the Zodiac there are 3 distinct decans. Each decan has a ruler which becomes the sub ruler of the sign or the co-ruler of that sign and each decan of a sign will be in the same triplicity (fire, earth, air, water) as the sign itself. Decans have the same order as they appear in the zodiac. The first decan is Aries and is ruled by Mars. The second decan is Leo, ruled by the Sun. As decans rule three degrees of each sign, the second decan of Aries is ruled by the Sun. The third decan of Aries would be sign after Leo etc. Does this sound complicated? It isn't really and the tables presented later will clarify the order, progression and powers of the various decans. The eBook covers a brief history of Astrological Decans, Zodialogical Associations, The Decan Images or 'Faces', A full description of each decan, his related planet, Archangel Decan Angel, Face name and description for five manuscripts. The correct incense, plant and gemstone to use in the Decan rituals. The Egyptian Gods, body areas, and personality traits associated. From a ritual perspective detailed instructions are give on how to make the Master Angelic Talisman, The traditional parchment talisman, and description on how to make the Decan Ring. Finally a description of the Demons of the Day and Night are listed. All in all a practical work book which collates our current knowledge of Angelic Decan Magick. 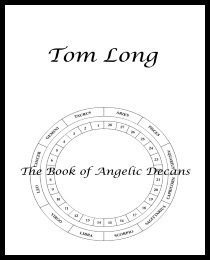 In this work by John Long he explores the magickal use of Decans from an Angelic Perspective, and therefore we are proud to include it in our Angelic Portfolio.